“America’s Indelible Stain” is a prayer for our nation. It’s an expression of my dream for what America can become – one nation under God indivisible. It is my interpretation of our national destiny and how we might collectively achieve racial healing and reconciliation. My hope is that it can also be a conversation piece for everyday people as they engage one another concerning the racial complexities of our time; perhaps a means for mitigating the discomfort and apprehension that people experience as they try to navigate issues of race in America. 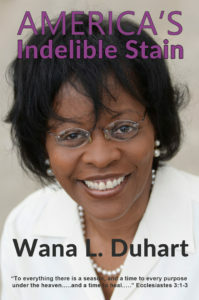 With this book, I am attempting to answer a calling, a spiritual mandate to do my part to proffer some direction for the healing of spirits, hearts, and minds that have been contaminated by the infection which we know as racism. Our country’s indelible stain is a spirit of racism and it continues to burden not only the soul of our nation, but the souls of people. “America’s Indelible Stain” should be viewed as a prescription for how we might overcome this spiritual cancer. It can be a moral impetus which causes people to ask the difficult and uncomfortable questions – to choose to dispense mutual respect and tolerance – and to reach beyond what’s traditional and embrace what’s unknown in relation to personal history and exposure. This is a challenge to people everywhere to take an inventory of their hearts and minds. To choose the road less traveled and work hard to do their part to figure out ways to respect and integrate people and things that are different from what they are accustomed. My hope is that it will help guide and advance our national conversations and debates about race. This piece can provide some insight and perspective into how the imprints on our hearts and minds pertaining to race are a consequence of the values and beliefs we learn from our families, culture, and communities. Because we are basically products of our personal, social, and spiritual environments, we become a composite of the people who have influenced us and what we have been exposed to in life. This is also an opportunity for people to embrace the notion that we are a part of one America, even though we may look, act, and think differently. While our racial distinctions may define how we are unique, our shared American ideals and aspirations reveal our likeness and kinship. Chapter 4: Who Will Lead Us? 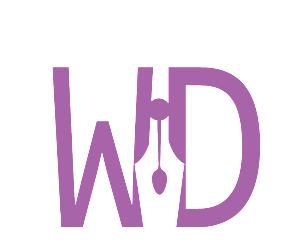 This essay is an attempt to provide a look at some of the realities that have evolved as people and organizations reexamine their everyday decisions in the contexts of shifting institutional priorities, changing global dynamics, underfunded public expenditures, and hidden agendas. 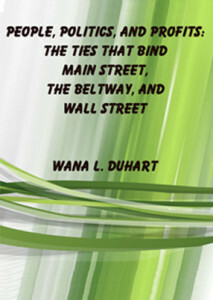 It describes how interdependent and inextricably linked Main Street, the Washington Beltway, and Wall Street are, despite inherent inequities across the spheres. In my discussion on Main Street America, I offer an overview of the shifts taking place as families and enterprises adapt to a new normal for their lives. “A Shift By and For the People” looks at how macro and micro changes are impacting individual citizens and the choices they make. “Equal Sacrifice at Every Level” reinforces the importance of shared responsibility as it relates to the budget priorities at every level of the public sector. “Class Warfare: The Elephant in the Room” is a reminder that the interests of all Americans must be accounted for regardless of class. “The American Electorate is Speaking, Is Anyone Listening?” describes shifting sentiments across the electorate as people’s incomes and investments shrink. The section on The Beltway is a look at some of the problems that continue to hinder real progress in Washington, D.C. “Deaf Ears and Blinded Eyes: Hypocritical and Schizophrenic Elected Officials” will sound familiar to some as it explores the double standards associated with our nation’s capital. The American Electorate is Speaking, Is Anyone Listening? 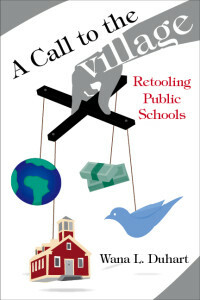 A Call to the Village: Retooling Public Schools is a road map for developing collaborative strategies that integrate the knowledge, ideas, expertise, resources, networks, and systems of the nonprofit, private, public, and religious sectors in the transformation of elementary and secondary schools. While most books on school reform focus on micro issues such as curricula, administration, special needs, standards and accountability, as well as school choice, this book focuses on the building and implementation of strategic partnerships across sectors via cross-sectoral collaboration. By combining successful strategies from the organizational and strategic coherence of the private sector, the spiritual and moral stewardship of the religious sector, the local and social service focuses of the nonprofit sector, and the public sector’s mandate to provide equitable public goods, this book offers a comprehensive and practical guide for retooling America’s public schools.